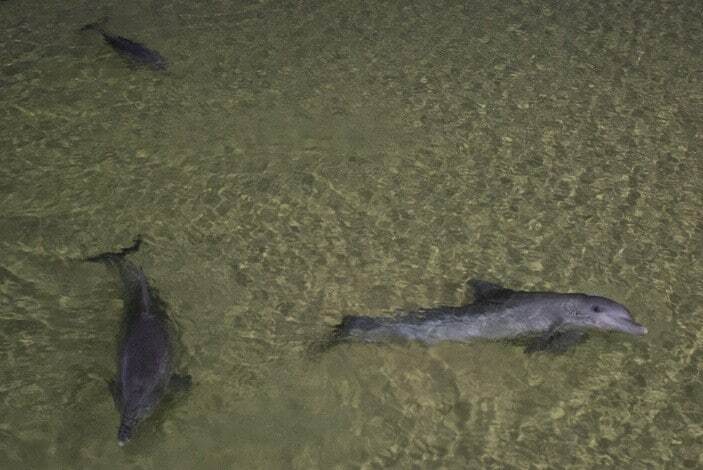 The sunset dolphin feeding at Tangalooma is an event simply not to be missed, with up to 10 wild Bottlenose Dolphins visiting the shores of the resort on any one evening. This unique activity offers the chance to get up close to a wild dolphin, to hand feed it some fish, and have your photo taken to commemorate the occasion. It’s truly hard to believe that these are ‘wild’ dolphins visiting the resort night after night. How do they know that the sun is setting? How do they know where to go? How do they know that it’s time to come in for their feed? These were all questions our Brisbane Kids asked and, truly, it is incredible how intelligent these dolphins are. Not only do a pod of bottlenose dolphins arrive on time every night of the year (not all dolphins turn up every night, but the same core group regularly visits), but these gorgeous creatures play and show off for their audience whilst they wait for the main show (i.e. the feeding) to start. The dolphin encounter begins with a short information session from the Jetty whilst the dolphins splash about in the shallows. (A free “Discover the World of Dolphins” presentation is additionally hosted daily at the Tangalooma Marine Education and Conservation Centre at 4pm daily, should you want to extend the experience.) From there, visitors who have booked for the dolphin feeding are invited to gather on the beach. Even if you haven’t booked the dolphin feeding, you are more than welcome to stand on the Jetty and watch this event. Once on the beach, we joined one of the lines, where one lane was set up per dolphin visiting on that day. There are three stops within the lane – the first station contains a bucket where we were asked to wash our hands and forearms to remove any perfumes, sunscreen, insect repellents or other nasties that may cause harm to the dolphins. (NOTE: If you are not well you are asked to stay away from the dolphins for the same reasons). The second station consisted of a big bucket of slimy fish. We were most entertained by the sea birds flitting from bucket to bucket in the hopes that someone left the lid off for a free treat. Miss 5 ½ and Miss 9 were resistant to grabbing hold of a slimy fish at first, but the attraction of getting up close and feeding a dolphin won them over. 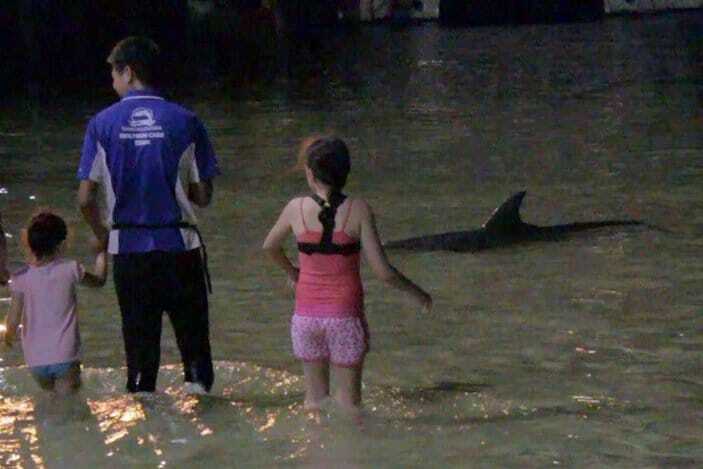 When we moved forward to feed our dolphin (Nari on this particular night), he started swimming towards us, noticing that three different sets of legs had entered the water. 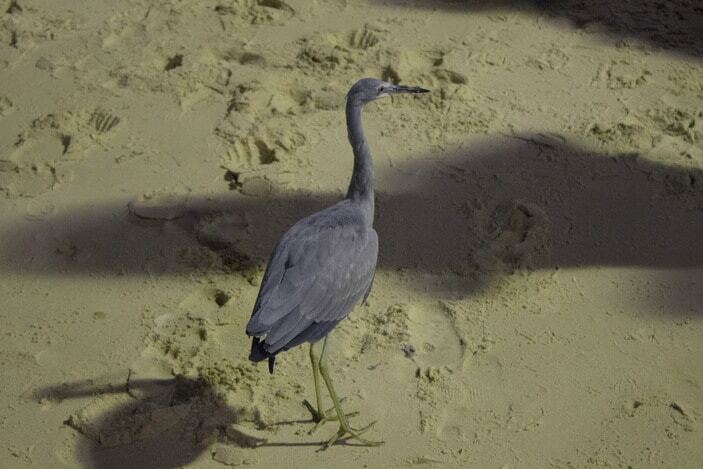 It was incredible how gentle he was—moving to each of us and opening his mouth for us to hold out a fish for him to softly take from our hands. The rush that this experience gave us was amazing! 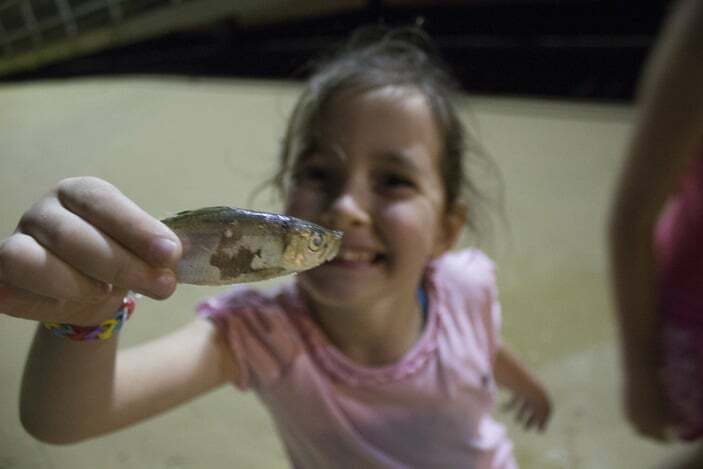 Being afraid of animals, Miss 9 was SO proud of herself for following through with hand feeding the fish to Nari and it was remarkable to see the boost it gave her. It was truly a once-in-a-lifetime experience that our family will remember always. How much does it cost to feed a dolphin at Tangalooma Island Resort? 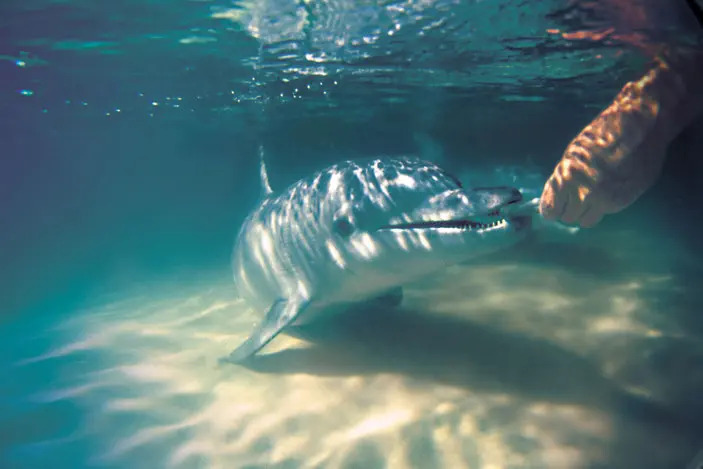 The dolphin feeding experience is generally included in your accommodation booking when staying at Tangalooma Island Resort, however we recommend checking when you book to be sure. This provides each member of your party with one dolphin feeding encounter each. Although there is no cost, you do still need to book your dolphin feeding experience on the day you wish to take part. 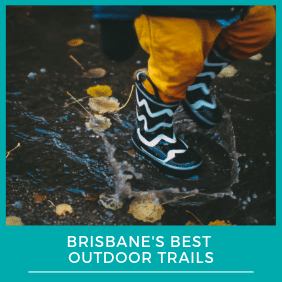 Bookings are taken at the Marine Education & Conservation Centre (near the Jetty) from between 1pm and 4pm daily. 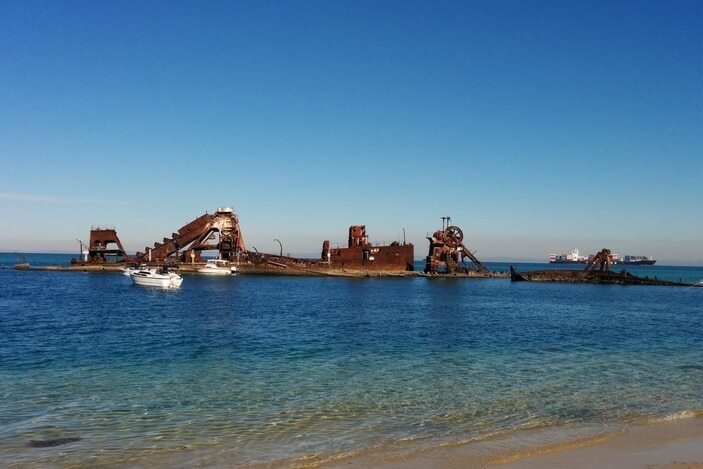 What time is the dolphin feeding at Tangalooma? 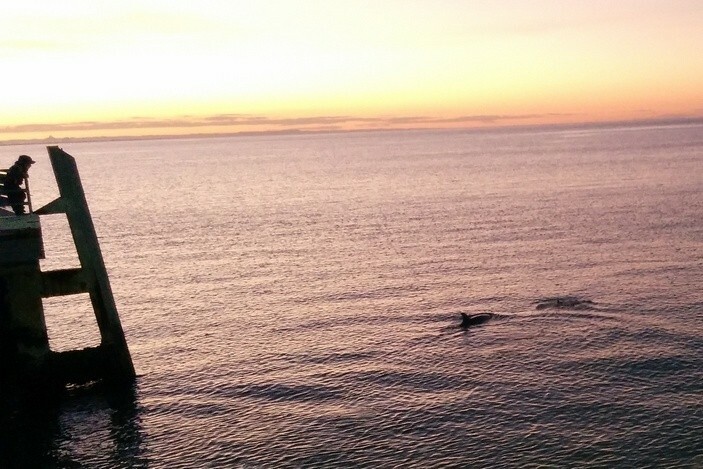 Dolphin feeding times can vary according to season; however the dolphins begin to come close to shore at sunset on the northern side of the jetty. Get to the jetty early and you can watch the dolphins swim in and frolic in the water alongside the jetty. As the sun is setting the presentation begins, followed by the hand feeding experience on the beach. 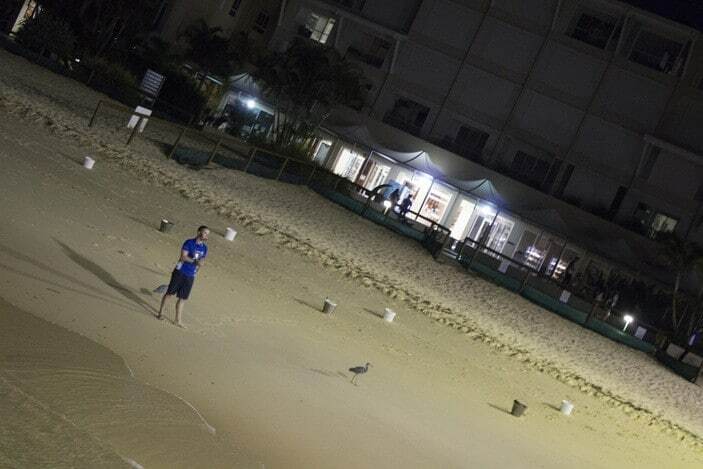 As a general rule, the resort asks that visitors do not approach or feed any of the wild animals at Tangalooma, except if taking part in one of the resort’s organised activities. This is to ensure minimal negative human impact on all animals that call this area home. With regards to dolphins, regulations in Moreton Bay state that “a person in water must not, without reasonable excuse, move any closer than 100 metres to a dolphin”. 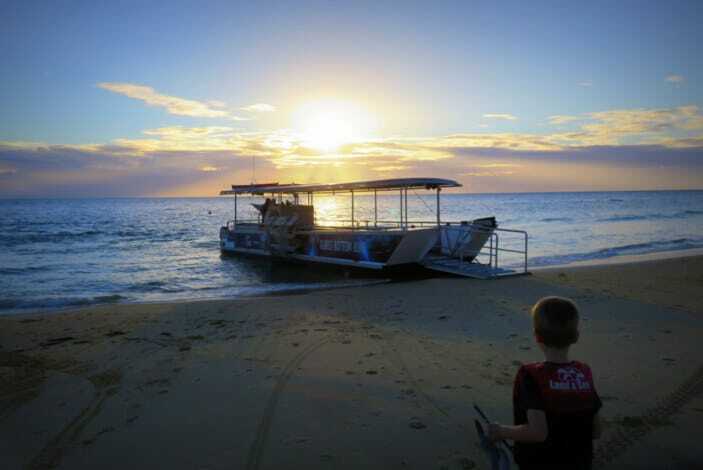 Brisbane Kids thanks Tangalooma Resort for sponsoring our writer and her family on their holidays to the lovely Tangalooma Resort and Moreton Island. Costs were covered. All the opinions stated in this review are true, honest and genuine with the sole aim of providing enough information for families to make an informed decision about future holidays to this wonderful local leisure destination. 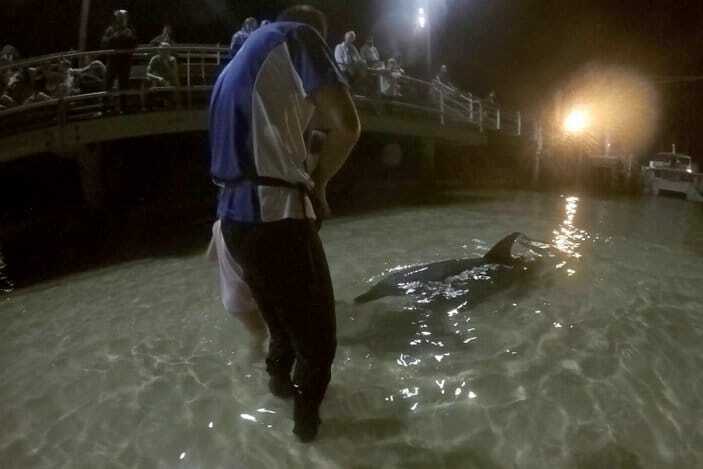 To find out more about Dolphin Feeding at Tangalooma Island Resort, including meeting the dolphins that regularly visit the resort and rules and tips for feeding the dolphins, please visit www.tangalooma.com/info/dolphin_feeding. 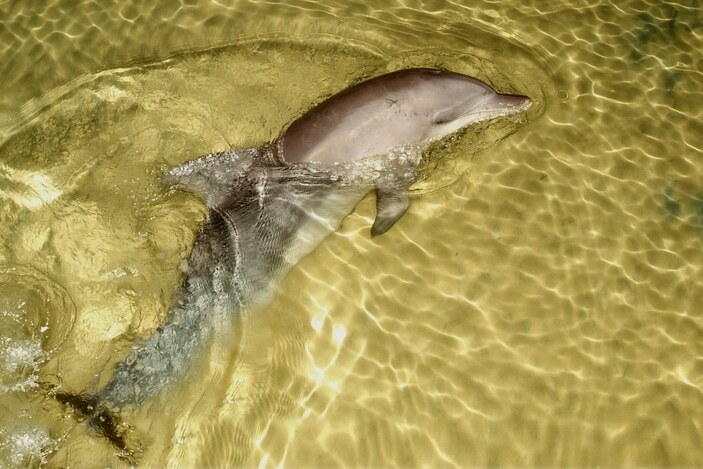 While you are at the resort, pay a visit to the Tangalooma Marine Education and Conservation Centre to learn more about the incredible Bottlenose Dolphin and the other wildlife of Moreton Island. 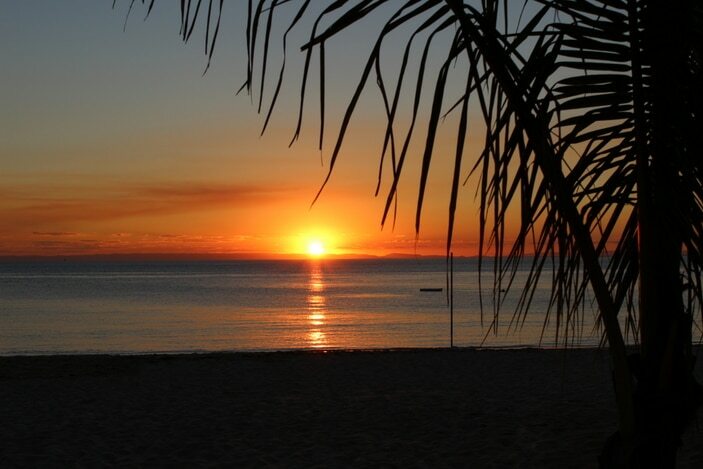 You can read all about the other fun-filled activities and the features of Tangalooma Island Resort in our Tropical Family Holiday recount.